When Arnold's parents bring an egg home and tell him he's going to be an older brother, Arnold is not convinced. Arnold knows the egg could be anything. . . maybe even an EGG OF DOOM! 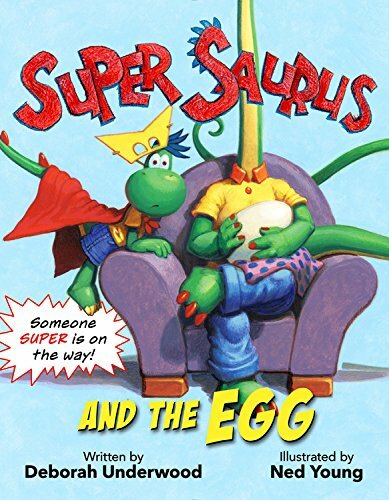 If a vampire-saurus flies out of the egg, Super Saurus will be ready! If a planet-crushing robot stomps out of the egg, Super Saurus will be ready! If Maud the Marauder jumps out of the egg, Super Saurus will be ready! But what happens if the Egg of Doom turns out to be Arnold's new little brother or sister? With the same wit, humor and charm that shines in Super Saurus Saves Kindergarten, readers will be captivated by Arnold's super imagination. This was a very cute book that looks at the birth of a new baby, but also how having a baby sibling is also important in so many ways. As the main character learns in this great book you are not losing anything but gaining so much in the end.